There were 3 low band stations, one on 160m, another on 80m and one on 40m. The problem was simple how could we share the Beverage antennas on all of these 3 stations ? 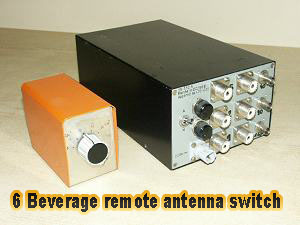 Good coaxial cable is not cheap and a way to have several antennas available in the shack over only one excellent coax cable is a remote switch. The contacts in the slide switch have larger contact surfaces than many a bought coaxial switch.